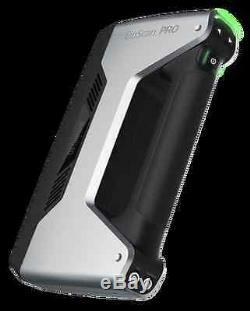 Einscan-Pro Multi-functional Handheld 3D Scanner from Shinning 3D. The high level professional 3D scanner. From the Official Authorized EinScan Distributor. This 3D scanner is without Turntable, Tripod and Color pack. 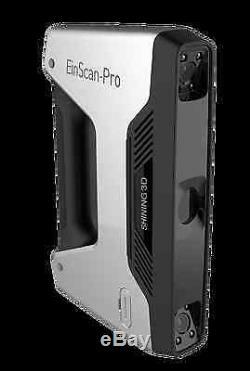 EinScan Pro is a new multi-functional handheld 3D scanner presented by SHINING3D. It provides longer scan range, higher scan speed and more applications for everone. It can rapidly capture the 3D data of the real objects to the computer, including human body as well as complex and irregular shapes. EinScan Pro Handheld 3D Scanner has the feature of easily using and the 3D scan softwares user friendliness leads you to finish scanning and realize the operation guided. EinScan Pro delivers watertight 3D data available to 3D print or reverse engineering directly, meanwhile it can output the unclosed 3D model for reversal design. Qty 1 Handheld Einscan Pro 3D Scanner Without Color pack, Turntable & Tripod. Handheld rapid scan, Handheld HD scan, Automatic scan, and Free scan, which makes EinScan Pro be one multi functional 3D scanner, satisfies the needs for portable scan and high-accuracy scan. Free scan & Automatic scan require Turntable & Tripod (Industrial pack). Handheld rapid Scan, Handheld HD scan, Automatic scan, Free scan, multi-function in one 3D scanner. EinScan-Pro is a multi-functional handheld 3d scanner, itcan be used to scan the industrial parts, sculptures, woodcarving parts, human bodies etc. In handheld scan mode, the scan speed is 10 frames/s. The Automatic scan and free scan mode single scan takes less than 2s. External texture camera can be attached to EinScan-Pro, capable of capturing the full-color 3D data of the object. Data output can be used for 3D printing as well as designing directly. Data format: stl, obj, asc. Professional 3D scanner with high data quality and entry-level price. EinScan-Pro can be one representative of high cost-effective in the 3D scanning industry. Color/Texture scan requires additional Color pack. Please look at our other Color pack listing. Free scan and automatic scan require additional Turntable & Tripod. Please look at our other Industrial pack listing. Reference point, feature, turntable align. Texture scan (Color pack add-on module). For transparent, reflective and dark object please spray powder firdt before scanning. Windows 7, Windows 8, Windows 10, 64bit Display cardNVIDIA GTX660 or higherDisplay memory>2GBProcessorI5 or higherMemory Storage16GB or more. We are glad to help you for any issue. The item "New Einscan Pro HandHeld 3D Scanner with 0.05mm Accuracy for Design Research Art" is in sale since Friday, October 28, 2016. This item is in the category "Computers/Tablets & Networking\3D Printers & Supplies\3D Scanners". The seller is "umax_75243" and is located in Dallas, Texas. This item can be shipped worldwide.